You are here: Home / Tours and Live Performances / 2014 Queenbert Tour / Lady Gaga Joins Adam Lambert + Queen Onstage! The fans in Australia were treated to an extra special addition to the phenomenally well-received Queen + Adam Lambert show! 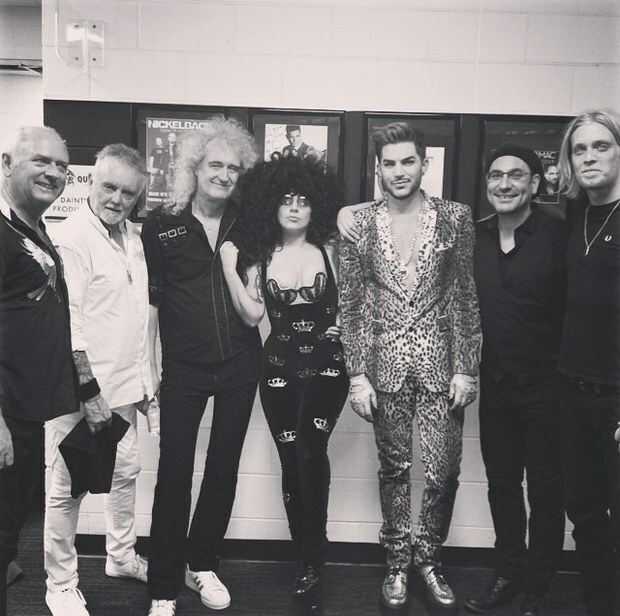 Thanks to an unlikely intersection of Australian tour routes, Lady Gaga was able to make a surprise appearance with the Adam Lambert-fronted Queen at the band’s Sydney stop on August 27th. The Artpop singer joined the group onstage for a performance of “Another One Bites the Dust,” with Gaga wearing a giant Afro and dark jumpsuit with little crowns embossed on it, since this was a Queen show. The Australian leg of Gaga’s artRAVE: The ARTPOP Ball trek kicked off earlier this week. Watch a crowd-shot clip of Gaga’s visit below. NOT a GaGa fan – she sounds terrible to me. If I was there to finally hear Adam and Queen I would have been disappointed that she took away so much time with Adam! Sorry 🙁 I just like my Adam time! Remind me – which one is the “super star”?? A pretty jarring difference in vocal ability! Yes – I am very glad she didn’t decide to join Adam when I saw him in LA – I would have been very disppointed having her interrupt his great performance!! Eeee, gads. At least we now know who’s the better singer. But either way, it’s good publicity and a lot of fun!!! She is the weaker singer, but a great musician in her own right. Fortunately there is 2 hours of music without her at this concert. I didn’t like when the lead singer of Fun took Adam’s thunder at iHeart…..but I’m over it now! Though I’m missing out on all of the musical magic and fun during the world tour I expect to see him in concert in the near future and am so looking forward to it. I think everyone just loves the artist besides the music. The world tour with Queen is just awesome and apparently so with Lady Ga Ga making an appearance in performing ‘Another One Bites the Dust’ with Adam Lambert. Just Awesome!!!!! Like always great performances by both of them. Totally agree with you, Shelby–she took away from the song, and Adam was so much better in every way!! I’m broken hearted! It just makes me sick that lady ga ga has to show up UNANNOUNCED!! She sounds horrible and she has to try and upstage Adam. Why would Queen even let her perform with them, but, guess not much they could do without insulting her. SHE SHOULD BE ASHAMED OF HERSELF JUST SHOWING UP, It seems like the more well deserved exposure Adam gets, the more the wanna be s try to bring him down. But, eat your hearts out a——s, HE WILL BE ICONIC!! YES HE WILL!!!! We have no idea what took place to get her on stage. I’m sure it wasn’t a last-minute “hey I’m here, can I sing too?” moment. But when I watched, I got the weird feeling Adam was playing up to her & she was ignoring him. Anyone else feel that too? I think by GaGa showing up unannounced and wanting to sing with Adam just shows how popular and loved he is. She didn’t sing well in this but then again NOONE can sing as great as our ADAM!!!! I didn’t feel that she was ignoring Adam,however Adam is the consummate performer generous with anyone on stage with him while she is an attention hog.All she accomplished was showing how out of her league she was trying to sing with Adam.They probably felt they couldn’t deny her coming on stage.She;s always said how she adored Freddie and that was why she took her stage name from one of their songs.IMO she just looked foolish. Oh,forgot to add that I was fortunate enough to see the show twice in July.Great seats;when Adam came up the side stairway I was maybe 5 ft.away from him! I would tell anyone,no matter how much you like listening to his music,try to get to a concert and see him live.Nothing compares to it.My friend that went with me knew very little about him,she went because it was “Queen”.She just about flipped out over Adam.Another Glambert born. We have a message board for Adam Lambert topics (http://www.fanforum.com/f326/). I noticed that your website (http://adam-lambert.org/#sthash.CmRuK7sw.dpbs) is a great site to keep up to date and learn more about Adam Lambert and we would love to start a partnership with your site and our board. I think that both our sites would benefit greatly from a share of traffic between our sites.